SQUEEZE Atts allow you to erase a post and its attachments. Just type the id of the post you want to scan and press “scan” or press Squeeze atts in the admin column. 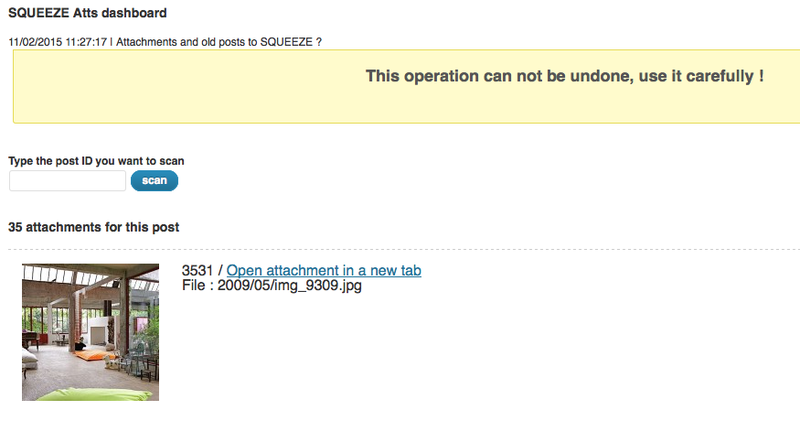 With SQUEEZE Atts, there is no need to use media library to delete attachments anymore. You can scan post by ID to see all its relative attachments. Confirm your choice and delete attachments, you’ll be prompt if you want to delete the post too. Squeeze Atts can delete all the files sizes created by the functions and third-party plugins. This plugin adds two admin columns, one column to display the number of files attached to the post, and one column with the link to the “Squeezer” page. Listing all the post attachments. Copy the brozzme-squeeze-att plugin into your wp-content/plugins/ folder. Go in the extensions panel and activate it. Is there any options to manage ? No, there isn’t any options to manage. Can I Squeeze atts for a page or video file ? With this release, you can just scan for post and image. The next release will contains more options and visual help. Brozzme, Benoît Faure, WordPress are not responsible of your potential errors and deletion.